Are you looking to hold a festival wedding or party at a venue where your guests will be able to camp under the stars? 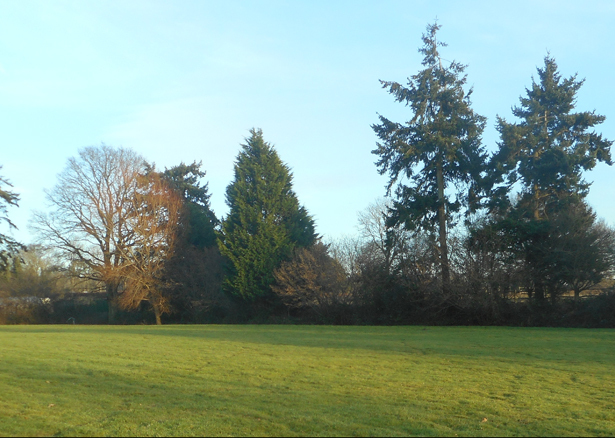 Come to The Party Field and you will enjoy exclusive hire of one of our picturesque fields. 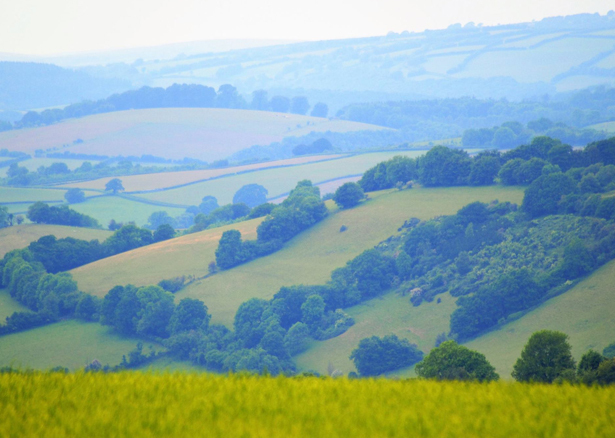 Set at the foot of the South Downs near the historic town of Lewes, East Sussex, nestled in the stunning countryside of rural Exmoor or our beautiful lakeside location in the pretty village of Pulborough, West Sussex. You will enjoy private hire of your chosen field for the weekend where you are free to create a festival wedding of your dreams, or just simply relax with your family enjoying the local countryside. 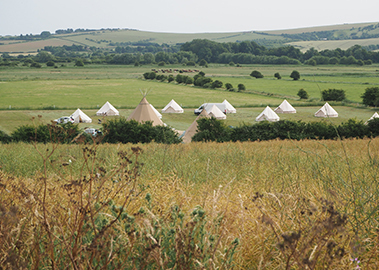 Our fields lend themselves as venues for anything from a relaxed family camping weekend to a fully bespoke event managed outdoor wedding. Explore the many ways we can help you make your party one to remember. As the field is exclusively yours we encourage you to make the most of it by lighting the campfire and pitching your tent. 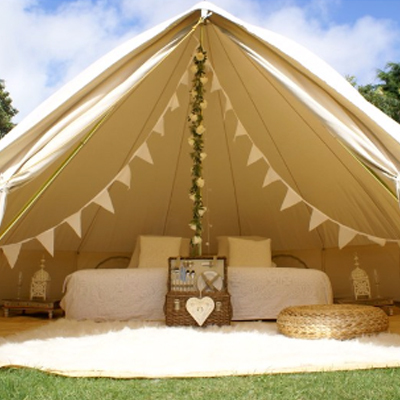 For those of you that don’t have your own tent we can supply beautifully furnished bell tents. We look forward to welcoming you to The Party Field. Each wedding or party at The Party Field is unique and personal, our bespoke service lets us create the perfect event for you. We are experienced event organisers who can help as much or as little as needed. We can either organise everything, so that all you and your guests need to do is arrive and enjoy your wedding or party, or you can simply hire the field and organise your own event using our trusted suppliers. The Party Field is the perfect place to have a beautiful country wedding. Exclusive use of your chosen field means you have the opportunity to personalise your day. From choosing everything from the marquee to the caterer you can shape a perfect day for you and your guests. We can work with you to put together a bespoke package for your day. We have built up excellent partnerships with a trusted group of local marquee companies. 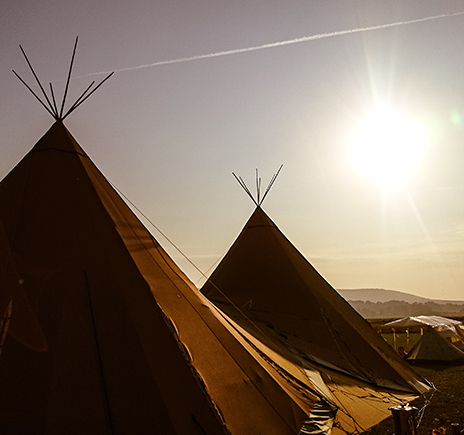 These suppliers can deliver anything from stylish traditional marquees to amazing tipi style tents. Have a look at Our Partners page for more information on what they can offer. Please contact them for a bespoke price. We are happy for you to arrange for your own catering, however we have recommended some local caterers. Also catering vans are welcome to all our venues, there is a huge amount of choice from paella to hog roast or ice cream vans. All of these suppliers can really help add that wedding festival vibe. If there is anything else you would like to do to make you party special please ask and we will do our best to accommodate you. With over 6 years experience of hosting wedding festivals at our stunning field venues, we have a wealth of advice we can offer. 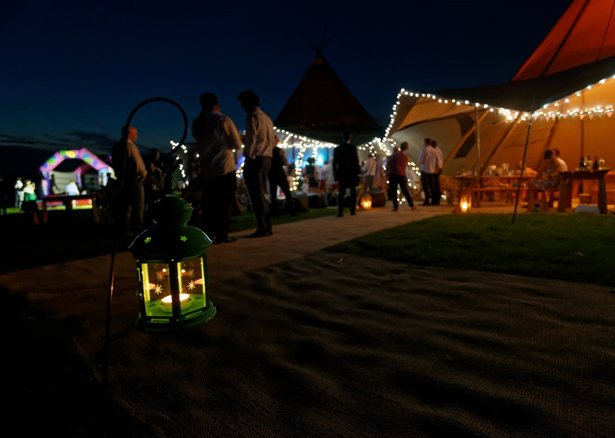 A big benefit of The Party Field is your guests can all stay together, light the campfire and camp in bell tents. Therefore you can create your very own wedding bell tent village with a special honeymoon tent for the bride and groom. Gather all your friends and family to create a party to remember. 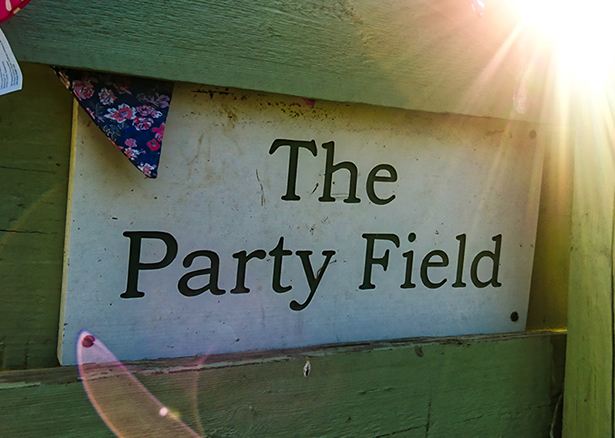 The Party Field is a private camping venue, which you can hire exclusively from Friday until Sunday. 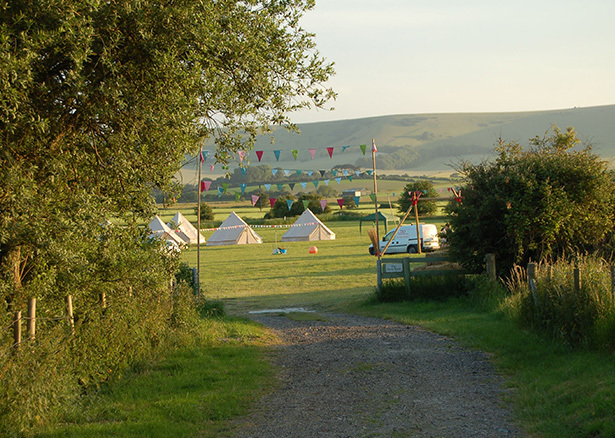 So you can invite your friends to pitch their tents or simply turn up and settle into the fully furnished bell tents. We are happy for you either to bring your own tent and pitch it with your friends or reduce the stress and hassle and hire one of our bell tents. We work with experienced bell tent companies at each field to provide our campers with beautiful furnished tents. These tents can sleep up to 5 people and include a double bed, Indian Rug, LED night light, Indian table and bunting (single beds can be provided on request). They can also supply unfurnished tents where you can add your own home comforts. Camping wouldn’t be the same without a campfire. We have a large centrally located fire pit which can provide the focal point to your stay. It’s a great place to toast marshmallows, cook sausages or simply gather under the stars. We will arrange for the hire of individual loos or luxury units to use during your stay (we do require all bookings to include the hire of a loo). Onsite we have running cold water. A generator will need to be hired if you require electricity – we can arrange this for you.